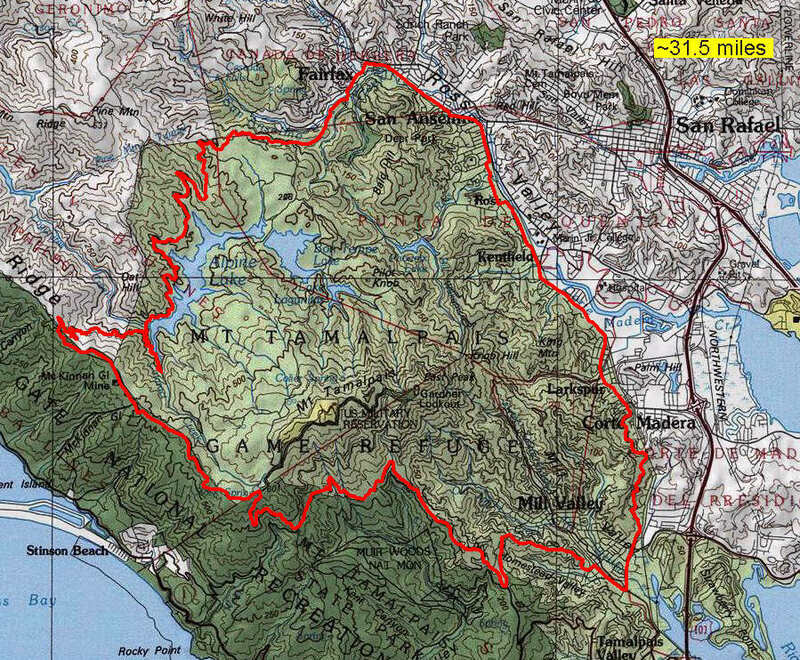 This is a medium-length road ride that encircles a good chunk of Marin County. It takes a roundabout route through the Marin "hill country" around Fairfax to climb most of the way up Mount Tamalpais, treats you to the views of the ocean at the higher elevations (as well as occasional glimpses of the bay), and then brings you back through Mill Valley and a chain of quiet suburban Marin towns. This ride starts from the center of Fairfax. My first choice for parking there is a lot between Broadway Boulevard and Sir Francis Drake that allows four hours of free parking. (It's the marker labeled "Fairfax Parkade" at the Suggested Parking link on your left.) Finding space there isn't always guaranteed unless you arrive early, though free street parking can be found throughout Fairfax, including along the approach portion of this ride route, but there can be rules such as parking being allowed only on one side of the street, so pay attention to the signs. The route sets out from Fairfax by climbing on Bolinas Fairfax Road. This is a moderate road climb until the trailhead of Pine Mountain Fire Road. The grade of this 4.5-mile climb ranges from 4% to 8%. From the end of this climb, it's mostly a nice descent with occassional short climbs, all the way down to Alpine Lake. The road descends all the way to the water level of Alpine Lake and then you cross the dam. If the water of the lake is still and you see the reflections of the surrounding hilltops on its surface, the name "Alpine Lake" might suddenly start making better sense. Very shortly after riding across the dam at Alpine Lake, you ride past the trailhead of Cataract Trail (right at the first right-hand hairpin curve). If you happen to be doing this ride at a time that followed shortly after some significant rains, it might be worth doing what I did and parking your bike somewhere near this trailhead (somewhere on the uphill slope behind some trees might work) and hiking at least part of the way up this trail to see the flow of the water, like I did on this ride. You'll notice that the GPS track lingers at this curve and creeps toward where I left my bike on the roadside. You might also want to bring a lock with you to make this more secure, of course. If it's during the dry season, however, you would do better by leaving it for a rainier time; the creek is less impressive when there isn't a substantial amount of water. Keep in mind that the route plot and elevation profile shown on this page include this hike but that none of the ride statistics do. To factor in the hike, add 1.5 miles to the distance, 400 feet to the total climb, and about half an hour to the ride duration. Bolinas Fairfax Road does another significant climb after this. This climb, which is roughly two miles long, almost never deviates from its average grade that's just under 7%. That's the last unbroken climb that you'll encounter on this loop. Once you're at the end of that climb, you'll be traversing Ridgecrest Boulevard. Ridgecrest keeps trending uphill, but the climb is not continuous and (consequently) is a bit gentler. It gains about 500 feet (though very unevenly) in its main two-mile uphill segment. Ridgecrest Boulevard is scenic for not only what you can see from the road, but also for what the road itself looks like. It playfully meanders through grass-covered rolling hills that descend to the coast on one side. This road is the darling of car commercials. If you see a curvy road through rolling green hills with the view of the sea in any car commercial on TV in the US, I would claim that there's something like a 30% chance that it was filmed on this road. It's that common. When you see it, you understand why. Riding or driving on it makes you feel like you're in a made-up landscape, designed just to be pretty. When you turn onto Pan Toll Road, a short but very scenic descent awaits you. From the upper portions of this sunny road, you can see the bay, the ocean, and even parts of Golden Gate and San Francisco. The route meets Panoramic Highway at the Pantoll Ranger Station (another opportunity for a rest stop). You can purchase park maps, books, and some gift shop items there, as well as find water, restroom facilities, picnic tables, etc. It also happens to be the primary campground area of Mount Tamalpais State Park and an intersection of many trails, so it's not a bad place for a rest stop featuring some good crowd watching. From there, Panoramic Highway will take you on a winding thrill ride, mainly under tree cover, without requiring you to pedal at all for a while. Once you emerge into the residential part of this road (starting from around Mountain Home Inn), there'll be one or two short stretches of climbing. But the descent then resumes to continue all the way to Mill Valley. The last third of the loop, which starts from Mill Valley, traverses a suburban landscape. The most "urban" stretch of the ride is the part on Miller Avenue and the first few blocks of Camino Alto around Mill Valley. After this, Camino Alto almost transforms back into a mountain road again as it first climbs and then descends Corte Madera Ridge. This is the last noticable climb on the ride. The climb is just over a mile long, and starts at a grade hovering around 6%, but quickly backs off to around 4%. Past that last climb, you descend back into suburban neighborhoods and then make your way through a quick succession of cute Marin towns. Corte Madera comes first, followed quickly by Larkspur. The few blocks of "main street" Larkspur, through which you ride on this route, provide enticing rest stop opportunities. I would especially relish the idea of getting some treats at Emporio Rulli there, whose hot chocolate I'm a big fan of. (Think "melted chocolate bars" rather than "cocoa powder in hot water"...) After the tiny community of Ross, which you might miss if you blink at the wrong moment, you soon find yourself pedaling through the main shopping strip in the San Anselmo town center. This is another slow street replete with coffee shops and eateries that you'll see catering to fellow cyclists. Once you break free from that center of density, it won't be long before you're heading into Fairfax and returning to your starting point. Since you'll find yourself at Fairfax at the end of your ride, the options there would lend themselves naturally for some post-ride food or drinks. Some quick suggestions would include the Java Hut or The Coffee Roastery for coffee, and Iron Springs pub or Gestalt Haus for a quick bite. I'm also fond of The Sleeping Lady for a post-ride meal; their salads and burgers are impressive, they have good beer and outdoor seating, plus the Ukulele Jam they have going every Saturday between 2:00 and 4:00 is a cute form of entertainment you might not find elsewhere (though the participating age group has a bit of a geriatric flavor). Finally, no biking-focused discussion about Fairfax could be considered complete without a mention of the Marin Museum of Bicycling. This local treasure has been (very justifiably) the new home of the Mountain Biking Hall of Fame ever since it opened in 2013. It's a great place to admire some seriously historic bicycles (some not even called that yet back then) going back to the 19th century and, more importantly, to see first-hand some of the very pivotal bicycles and read their stories from the early history of the sport, many of which were ridden on Repack Road and the other trails in the very hills surrounding the town. That's without getting into the distinct possibility of running into Joe Breeze himself at the museum, or one of the other "founding fathers" of mountain biking. I would strongly recommend this place to any first-time visitor. In fact, the museum is easily worth a visit in its own right to anyone who has a serious interest in the sport. Moreover, it's not of interest only to mountain bikers. Many of the exhibits are related to road cycling.